Turkey's parliament has approved a new draft constitution paving the way for a presidential system of government. The reforms - which would significantly increase the powers of President Recep Tayyip Erdogan - received the required three-fifth majority in the assembly. The bill will be put to a referendum, probably in April, and will become law if more than 50% of voters back it. Critics say the move could usher in authoritarian rule, and amounts to a power grab by Mr Erdogan. But the president says the changed system will resemble those in France and the US. The constitutional reform bill was approved by 339 of the 550-member assembly. Who is Turkey's dominant president? Mr Erdogan assumed the presidency, a largely ceremonial position, in 2014 after over a decade as Turkey's prime minister. The reforms would let the president retain ties to a political party, so Mr Erdogan could resume leadership of the AK Party (AKP), which he co-founded. Opposition leaders say that would abolish any chance of presidential impartiality. 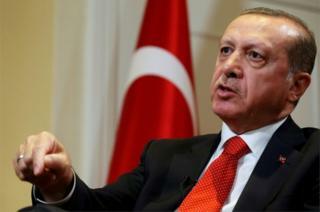 It has been suggested that Mr Erdogan could remain in power until 2029 under the new rules. The draft constitution states that the next presidential and parliamentary elections will be held on November 3, 2019. If the clock on Mr Erdogan's presidency re-sets from 2019, that would allow him to stay in the job until 2029, not 2024. Mr Erdogan has not made clear whether this would be the case. The president would be able to directly appoint top public officials, including ministers. He would also be able to assign one or several vice-presidents. The job of prime minister, currently held by Binali Yildirim, would be scrapped. The president would have power to intervene in the judiciary, which Mr Erdogan has accused of being influenced by Fethullah Gulen, the Pennsylvania-based preacher he blames for the July 2016 coup against him. The president would decide whether or not impose a state of emergency. Turkey's Prime Minister Binali Yildirim congratulated MPs on passing the constitutional changes, saying: "We have done our job. Now we convey the issue to its real owner, our people." Kemal Kilicdaroglu, the leader of the opposition Republican People's Party (CHP), urged Turks to "spoil the game that was played in parliament". He described the approval of the presidential system as a "mistake". Debates over the constitution changes have been heated. 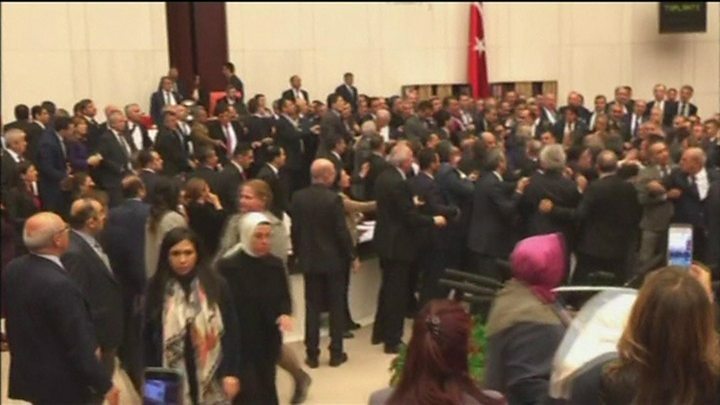 Last week a fight broke out in parliament after the AKP clashed with CHP members when an MP tried to film a voting session during a debate. The pro-Kurdish Peoples' Democratic Party (HDP) boycotted the vote. To secure its necessary majority, the AKP has relied on the support of the rightwing Nationalist Movement Party, the fourth-largest in the legislature. Turkey has been in a state of emergency since a failed coup in July. The status was extended after a series of attacks on the country, including a mass shooting in an Istanbul nightclub on New Year's Eve.